hectare game reserve within 1 hour from Johannesburg and 30 minutes from Pretoria, and offers self-catering accommodation in fully equipped units. In the heart of Gauteng, Dinokeng ‘a place of rivers’, and Leeuwkloof valley, is a game lodge surrounded by wildlife roaming in a 400 hectare game reserve. This is KwaThabisile Game Lodge where Alexandra welcomes you to her Out of Africa. Wander over to the pond or laze by the pool and enjoy sunset drinks overlooking the valley and into the bush watching the animals graze. Enjoy the sounds of birds sing in our valley, see and hear the night come to life. At KwaThabisile you can experience nature even though you are close to many other enriching activities such as nearby Cullinan and experience ‘All of Africa in a day’ or in our Dinokeng Big 5 Game Reserve, the first Big 5 free-roaming game reserve in Gauteng. 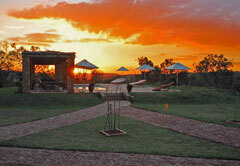 Big 5 free-roaming game, Dinokeng Big 5 Game Reserve, Game Lodge / Self Catering in Cullinan, KWATHABISILE GAME LODGE. Bookmark.